Natural ventilation is a back to basics approach using mother nature as the principle driving force. It offers a straightforward low energy cooling strategy which can provide year round comfort, with flexible user control, but with a low capital and maintenance cost. Modern buildings with their low u values and high heat gains typically have a high cooling requirement. The climate in the UK and many parts of central through Northern Europe is perfectly suited for Natural Ventilation applications with low extremes of temperature providing an ample supply of fresh cooling air even in a typical summer. 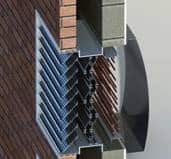 Natural Ventilation strategies are founded on two basic operational strategies essentially comprising of either wind driven or a buoyancy (stack effect) system. In some locations and building designs wind alone can be used as the principal driving force. In wind driven systems the air on the windward side of the building creates a positive pressure with corresponding negative pressure generated on the leeward side. Using this effect air can be easily drawn through the building. Although wind driven systems can be effective, building design, orientation and location factors are important here for a successful result. Although helpful, Natural ventilation systems do not need wind to operate satisfactorily. More reliable and effective strategies simply employ buoyancy and stack effects instead to provide the ventilation base. Instead of wind pressure a vertical stack or shaft in the building can be utilised to allow warmer air to migrate and rise through the building to high level outlets whilst drawing fresh cool air in from low level. 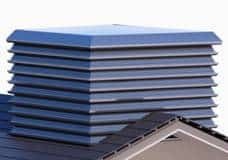 Stack ventilation does not rely on the wind at all and, because it does not rely on the pressure or the direction of the wind either, it offers greater reliability as well as more flexibility on the placement and location of the air intakes. Traditionally windows have often been used as an air inlet but whilst a simple solution are not without their disadvantages. A key requirement with natural ventilation systems is the use of low overnight temperatures to bring cool night air into the building. Opening windows at night is not usually desirable from a security aspect and noise penetration and water ingress are also difficult to avoid. Window motorisation can compromise aesthetics and windows also may not offer the fine levels of control and balance available from a low leakage volume control damper. Instead Gilberts Mistrale System focuses on using optimum, measured performance components that include a secure external weather proof intake louvre, a fully controllable insulated air volume control damper, an optional heating or cooling coil, a covering fascia grille and a range of intake/exhaust penthouse roof turrets.